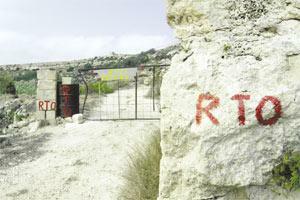 Writing on the wall: RTO, or for the uninitiated "reserved", which practically means keep out of the path leading to Ras ir-Raheb. Following a close encounter with a gun-toting man in the limits of Ras ir-Raheb, close to Bahrija, a group of ramblers have written to the Estate Management Department asking whether an important archaeological site such as the one in question is out of bounds to the public. The ramblers, who included several of archaeologists, were on their way to the area to visit the historic remains there recently when they were asked to leave by a man carrying a gun. Shortly after the incident, in a terse reply the department wrote back to the temporary secretary of the soon-to-be-set-up ramblers' association: "I am directed to inform you that land in question is in course of expropriation which was expropriated by Government Notice 498 dated July 29, 1975. As such, legally land in question is still privately-owned since deed of transfer is not finalised". Seasoned rambler Lino Bugeja, who is fervently campaigning for what remains of the countryside to be opened up to ramblers, said that getting such an answer was inconceivable. "How is it possible that 30 years after the government issued an expropriation order, such a parcel of land of high archaeological importance is still in private hands? "Moreover, the archaeological site is not indicated in the Malta Environment and Planning Authority's site plans which, again, I find hard to believe especially when one knows how detailed such plans drawn up by the British authorities used to be. Ras ir-Raheb is also known as Ras il-Knejjes. "The vast area, which is out of bounds to ramblers and archaeologists, includes the Bahrija Punic village, the Ras ir-Raheb Roman remains and the archaeological remains at Ras il-Pellegrin," Mr Bugeja added. In a paper published in Melita Historica vol. X no. 1 (1988), Mario Buhagiar wrote: "At Ras ir-Raheb... the archaeological importance of the place has been known since at least the 16th century... The two Semitic toponyms, Ras ir-Raheb (headland of the hermit) and Ras il-Knejjes (headland of the churches) may indicate that the site had some religious significance in the late Middle Ages". Another avid rambler, Michael Camilleri, recalled how together with a friend he was trekking one evening at Ras il-Pellegrin when to his horror only about 100 metres away from the promontory they saw a shabby stone hut attached to which was an old caravan - painted in black and green camouflage. "On closer inspection, it seemed as though the caravan had been there for some time because its wheels had been removed and parts of the axle were strewn about. "To add insult to injury, whoever was responsible for this structure even laid tiles by the hut and the caravan... Later I told myself: Could this piece of land be private? Even if this were the case, is one allowed to carry out such aberrations?" Mr Camilleri explained that he and his friend that night camped close to the beach at Fomm ir-Rih. "The next morning, as we were packing up, an elderly Greek man came shouting at us, telling us we were trespassing. He claimed he lived in one of the houses perched on the cliff above Fomm ir-Rih bay and, furthermore, that he owned all the land leading down to the shore. "The man said there was a bylaw stating that the public has a right to use the beach. But it is only accessible through a very narrow path," Mr Camilleri continued. Mr Bugeja said the mediaeval period in Malta was replete with episodes when the Maltese, often poor illiterate peasants, stood up for their rights and rebelled against those who attempted to deny them the right of access to the land. The most outstanding episode is that of 1427, when King Alfonso pawned the islands against the people's wishes to Don Consalvo Monroy. "Eventually, the Maltese came to an agreement with King Alfonso a year later when they raised 30,000 florins for the redemption of Malta and Gozo," Mr Bugeja noted. The Monroy incident is recalled in a marble plaque dated 1447 and affixed to the wall by the main gate in Mdina. The plaque states that by order of the king the islands were annexed to the royal domain. In his attempt to regain for the public the right to use paths leading to sites of archaeological and scenic value, Mr Bugeja, together with a temporary committee, will be launching a Malta Ramblers' Association which has already enlisted the backing of the national heritage trust Din l-Art Helwa. The ramblers' association will be launched at the premises of Din l-Art Helwa in Melita Street, Valletta, on February 17 at 10 a.m.